Over the years, Google has consistently created beautiful ‘doodles’ – creative takes on its logo that show up on its homepage – to commemorate festivals, holidays, and significant events in history. Today, the company’s knocked it out of the park with its first-ever AI-powered doodle to celebrate the 334th birthday of Baroque composer extraordinaire Johann Sebastian Bach. 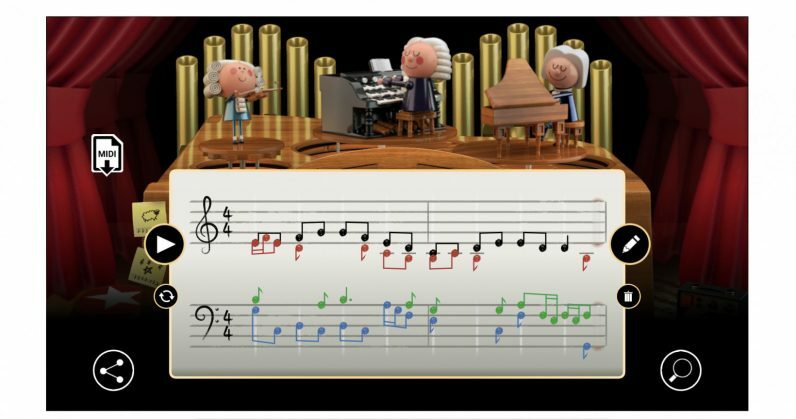 The beautifully illustrated doodle has you write out a couple of bars of sheet music, choose a key, and then have Google‘s custom AI flesh out your melody with a harmony in Bach‘s signature style. There are a bunch of buttons that surface additional features and a couple of preset tunes; it all works really well, and is sure to take up several minutes of your time today. The doodle is powered by Coconet, a machine learning model for manipulating music. It’s been in the works for three years, and has been trained with a dataset of 306 chorale harmonizations by Bach. That enables it to generate polyphonic tunes in the composer’s style. We take a piece from Bach, randomly erase some notes, and ask the model to guess the missing notes from context. The result is a versatile model of counterpoint that accepts arbitrarily incomplete scores as input and works out complete scores. This setup covers a wide range of musical tasks, such as harmonizing melodies, creating smooth transitions, rewriting and elaborating existing music, and composing from scratch. Head to Google’s home page to try it out for yourself, and visit the Magenta blog to learn more about the fascinating AI wizardry that went into creating this doodle. Remember a better Google doodle from back in the day? Let us know in the comments.